We’re delighted to announce that for this year’s Edinburgh Fringe Festival, we’re partnering up with the renowned Glengoyne Whisky Distillery to bring whisky fans something truly spectacular. 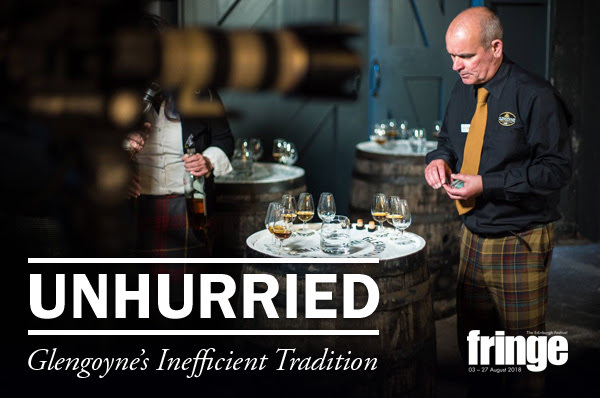 ‘Unhurried – Glengoyne’s Inefficient Tradition’ is an entertaining and interactive single malt experience – featuring an exclusive taste of Scotland’s best gastronomy from inside Cannonball’s Glengoyne Room. Hosted by Fringe veteran, ex BBC Broadcaster and Comedy Writer, Gordon Dallas, the show uses cutting edge Projection Mapping technology to take you on an immersive journey, exploring the almost absurd lengths and apparent inefficient traditions Glengoyne dedicates itself to, all in the name of incredible whisky. Situated at the top of Edinburgh’s Royal Mile and next to the city’s famous Castle, the Cannonball is a hugely popular venue that’s steeped in history. Once you drink in the breathtaking views of the Castle and the Mile, you’ll soon see why. You’ll also get the opportunity to taste the flavoursome results of these illogical actions in three distinct drams of Glengoyne. Each of which have been paired with delicious food tasters. Hurry! To get your tickets today, simply click the button below. You won’t want to miss this.